Cheeca Lodge & Spa has set the standard for luxury Islamorada accommodations in the Florida Keys since 1946. Our rooms and suites exude elegance and a casual ease that welcome any traveler. Discover a relaxed atmosphere honed over decades of glamorous guests and generations of family retreats. 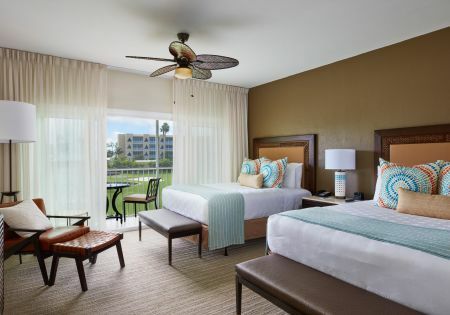 Our 214 rooms and suites are an oasis of relaxation and comfort for unforgettable Islamorada lodging. 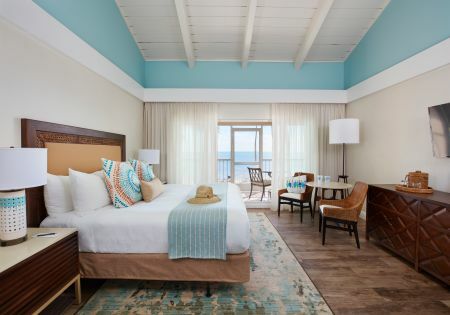 Designed in a rich West Indies décor, our opulent accommodations are complemented by thoughtful amenities. 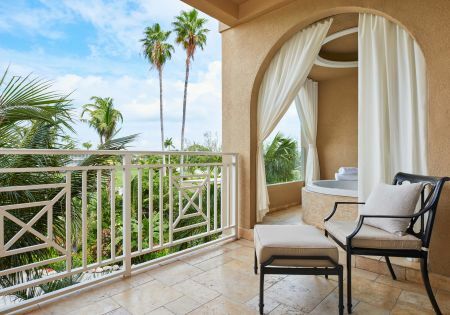 Discover paradise within reach with a stay in our Resort View guestrooms and suites which offer stunning views of lush tropical gardens and our executive golf course. 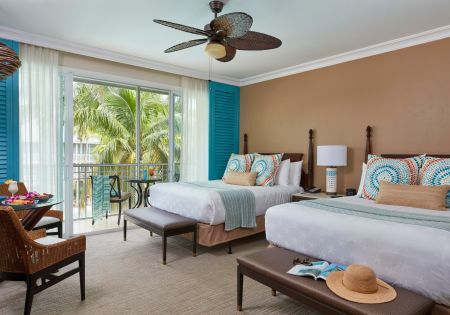 Perfectly poised to bring the best of the Florida Keys at your fingertips, our Resort View guestrooms offer an idyllic destination for business and leisure guests alike. 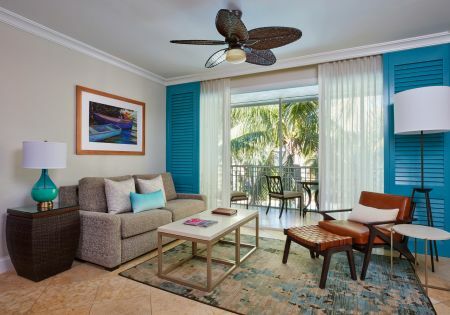 Indulge in modern comforts and vacation on your own terms. Whether you’re looking for serenity, adventure or everything in-between Cheeca Lodge and Spa looks forward to helping your tropical dreams come to life. Go ahead, discover where comfort, convenience and summer start. 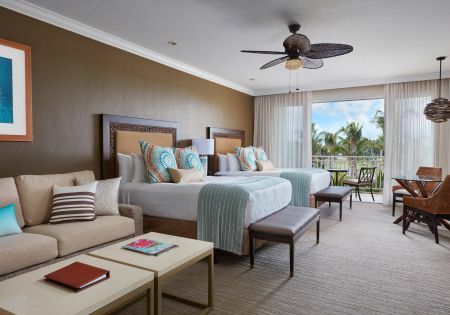 This spacious room boasts classic West Indies style décor and private screened in balcony offering fabulous views of the Jack Nicklaus designed 9-hole golf course. 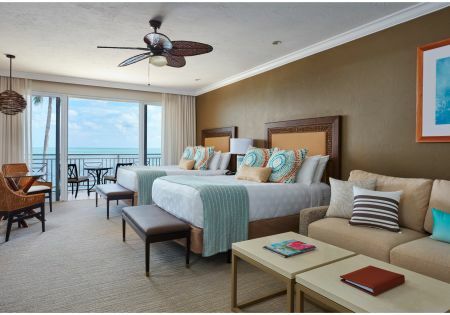 Come experience our luxury resort in the Florida Keys on your next golf getaway. 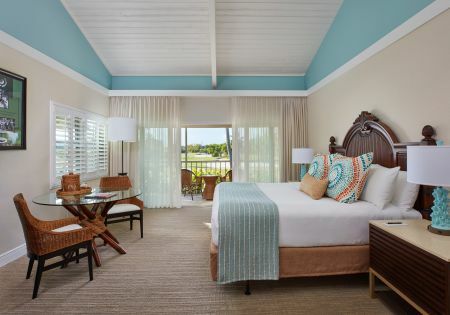 This spacious room boasts classic West Indies style décor and private screened in balcony offering fabulous views of the Jack Nicklaus designed 9-hole golf course. Spread out and relax among 681 sq. ft. of paradise in the Florida Keys. Discover your own personal oasis in our Golf Course One Bedroom Suite at Cheeca Lodge & Spa. Be greeted by 361 sq. ft. of space adorned with two plush Queen Beds, spacious screened in balcony, a deep soaking tub and separate glass shower stall. Enjoy a serene setting within easy reach of the tennis courts and tropical gardens. Need extra space? 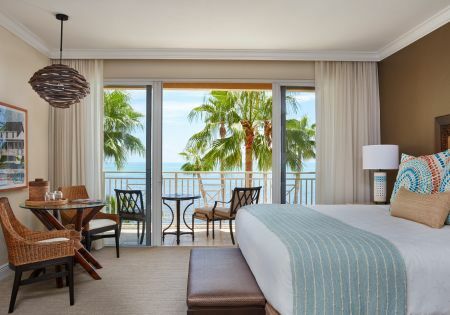 This guestroom can connect with the luxurious Resort View One Bedroom Suite to accommodate up to eight. 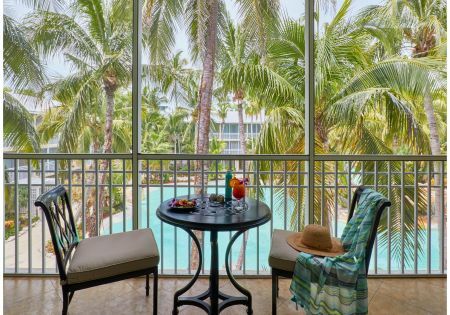 Enjoy premier views of our Florida Keys luxury hotel and a location within easy reach of our tennis courts and tropical gardens while staying in this suite. 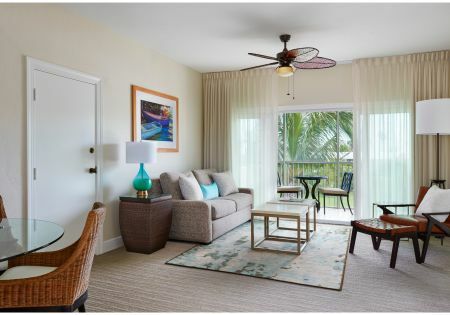 In addition to an inviting aesthetic this Resort View One Bedroom Suite offers a spacious living room with Queen Sized Pull Out Sofa, screened in balcony with seating for two, full kitchen and much more. Need extra space? This guestroom can connect with the Resort View Double Queen Guestroom to accommodate up to eight. This adult only area room boasts 415 sq. 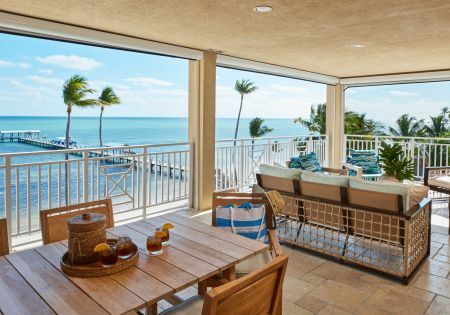 feet of living space, a vaulted wood beam ceiling, classic Florida Keys décor, and a private screened in balcony offering views of the beautifully landscaped grounds and some with partial views of the pool or beach. 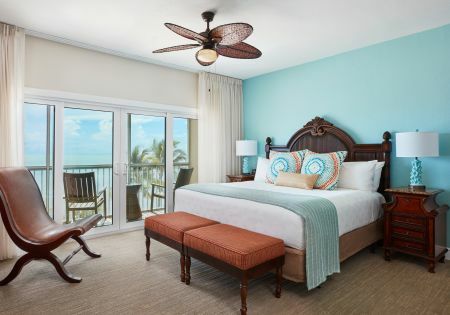 Come experience one of the top Florida Keys luxury resorts and enjoy extra space in this Resort View Bungalow. Enjoy 840 sq. feet of space with two plush Queen Beds, a spacious living area with Sleeper Sofa, large open air balcony with private soaking tub. This opulent island view Double Queen Suite is an open floor plan and conveniently located in our Main Lodge building. *Accessible rooms available upon request. Please contact our reservations team by email or by phone at 800-327-2888, or email at ada@cheeca.com for more information on how to reserve an accessible room. The Lodge Island View King Suite features 840 sq. feet of space, floor-to-ceiling glass doors, posh interiors and a large open air balcony with private soaking tub and island views. Conveniently nestled in our Main Lodge, this open floor plan suite offers unparalleled access to the best that Cheeca has to offer. 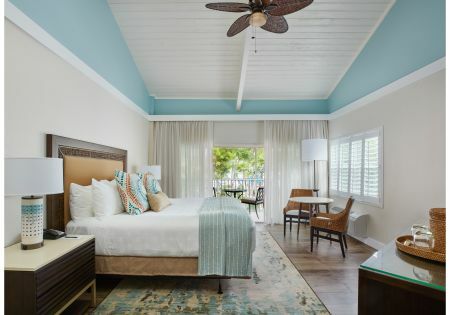 This spacious dog friendly room boasts classic West Indies style décor and private screened in balcony offering fabulous views of the Jack Nicklaus designed 9-hole golf course. Pup in Paradise Package is required for dog access to room. Please contact the resort for more details for your pup friendly stay. Note that dogs may not accompany guests to restaurants, bars, pools, beaches, or other public areas as directed by resort. 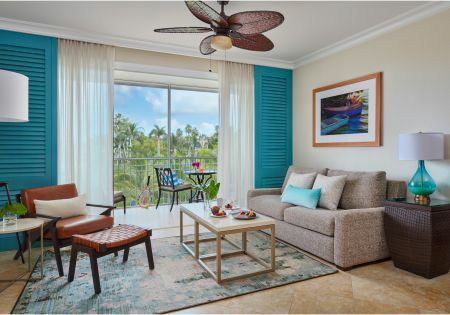 This spacious dog friendly one bedroom suite boasts classic West Indies style décor and private screened in balcony offering fabulous views of the Jack Nicklaus designed 9-hole golf course.